To-Do Lists. Do they help? You wake up to start the day and your mind naturally starts putting together a to-do list right away. The morning list then goes on and on and on and on. You haven’t even gotten to start your work day yet and create that to-do list! 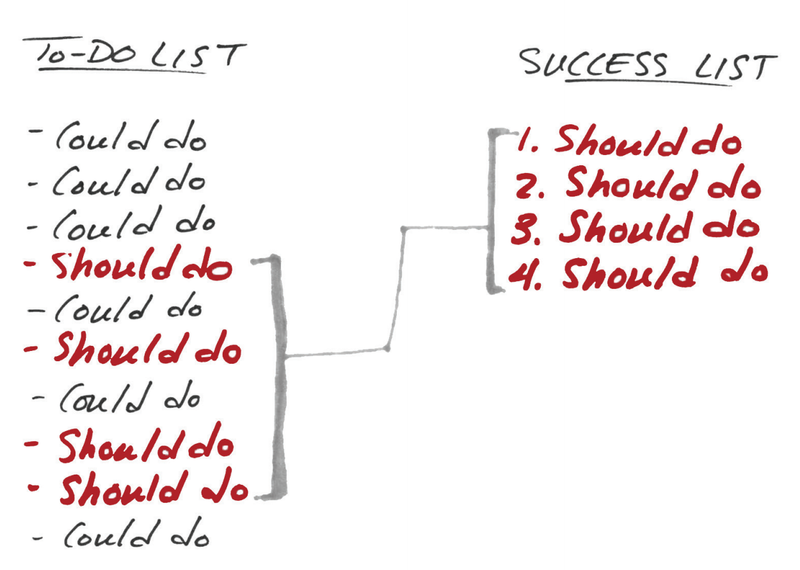 The question we ask, is it good to have a to-do list? Does that help you figure what needs to be done and get through your day? Does the to-do list slow you down? Does it have you focusing on the things that aren’t really moving you forward? Many of us like to create to-do lists. That way we can clear all of the thoughts that are running around in our head. By putting them on paper it allows us to stop thinking about them and know we will get them done. Many of us love to check things off on our to-do list because it makes us feel like we have accomplished something with our day or our time. A mentor of mine taught me early to create a to-do list each day and then sort the list with the most important thing at the top. He then told me to draw a line between #5 and #6 on the list and my day could not end until the top 5 were complete. According to the studies and research shared in The ONE Thing it is time to take that to the extreme. As you create your to-do list, sort it with the most important thing and do the first thing and the first thing only. Once that is done, sort your list once more. If you have the correct item at the top of your list, completing it should make everything else easier or unnecessary in your world. Remember that the majority of what you want will come from the minority of what you do. Turn your to-do list into a success list! By asking yourself the focusing question you will find the item that should be #1 on your success list help you work on the right thing! Chadalyst – Create your to-do list and then ask yourself the focusing question – What’s the ONE thing I can do today such that by doing it everything else will become easier or unnecessary. Now review your to-do list and convert it into a success list. Find that FIRST domino! Have you ever found yourself facing a large challenge and not even sure where to start? Have your taxes piled up and it is April 13th? Have you looked up at your annual goal and realized it is already summer and the year is half over? Have you opened your computer to too many emails to even know where to start your day? Most of us have heard Mr Abrams’ quote, although it doesn’t solve the question of which part of the elephant should we bite first? The answer to that question is one that still challenges most people. We learn how to overcome a large challenge by making it small and still we just stare at the challenge waiting for someone to show us step one. Step one has now been shown to you. It might not be a bright flashing arrow pointing you in a specific direction. Maybe it won’t be as obvious as the yellow brick road was to Dorothy and Toto. Gary Keller and Jay Papasan made it quite simple when they wrote the focusing question in The ONE Thing. What is the ONE thing that I can do today, such that by doing it everything else will be easier or unnecessary? If you ask yourself this question at the start of your day or at the start of a project the place to start on the path to success should become clear to you. Take your large challenge and break it down to the smaller challenges using the focusing question. Remember this might take a few steps to get it to the correct starting point. As shown in this geometric progression a domino can knock over a domino 1 1/2 times larger. What that means is you can see that by knocking down one 2 inch tall domino you are able to knock over something as large as the Leaning Tower of Pisa with your 18th domino in the progression. Find your starting point by going small. Line up your dominoes correctly and before you know it your large challenge will be falling over! Asking the focusing question is the best way to clearly find the starting point of your path to success and help you overcome a large challenge by making it small. Chadalyst – Ask yourself the focusing question – What’s the ONE thing I can do today such that by doing it everything else will become easier or unnecessary. Now ask it again in regards to the answer you received. How small can you go? Find that FIRST domino!